The Southern Illinois University Edwardsville School of Pharmacy (SOP) paid tribute to the extraordinary impact of retiring Director of Student Services Connie Stamper-Carr and honored former Dean Gireesh Gupchup, PhD, at the first Special All-Alumni & Friends Anniversary Gala held Saturday, July 14 at the Hilton St. Louis at the Ballpark. 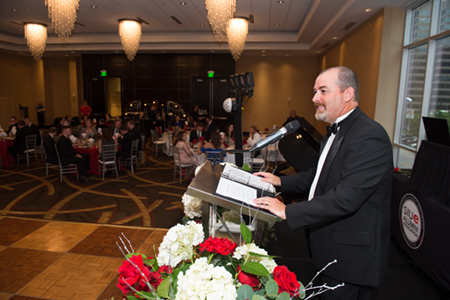 The gala’s approximately 130 attendees included alumni, current students, faculty, staff, members of the Pharmacy Advisory Board and friends. In April 2017, nine SOP alumni formed a planning committee to conduct the “Campaign 4 Connie” (C4C) to raise the funds needed to establish an endowed scholarship in Stamper-Carr’s honor. They also planned the special all-alumni and friends gala and reunion to formally recognize her and dedicate her scholarship. 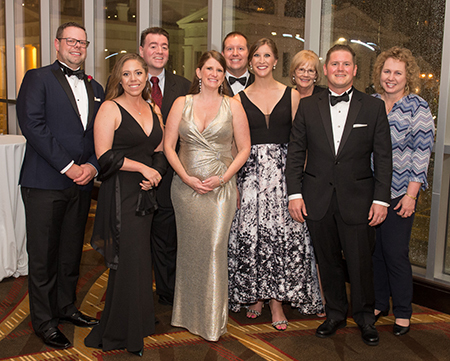 “The C4C planning committee worked tirelessly for more than a year to successfully raise $28,000 for the scholarship, and provide an iconic, unforgettable experience for the entire School of Pharmacy community,” said Senior Director of Development Patti McDonald. Gala highlights included a meaningful program honoring Stamper-Carr’s retirement, Gupchup’s influential tenure as dean, the School’s 10 graduating classes and the Class of 2013’s five-year university, as well as entertainment by the SIUE Jazz Ensemble and a DJ from Millennium Productions that was sponsored by the SIUE Alumni Association. Alumni Council President Harry Zollars, PharmD ’13, recognized the work of alumni in making the gala possible. He says one big idea turned into an incredible evening of celebration. The SOP has nearly 750 alumni spanning the region, nation and globe. Each of the SOP’s classes has scored above average on the state licensure exam and most have scored above average on the national licensure exam (NAPLEX). The Class of 2017’s first-attempt board pass rate was the highest of any program in Illinois or Missouri. The NAPLEX results place SIUE in the top 30 percent of all pharmacy programs in the country. 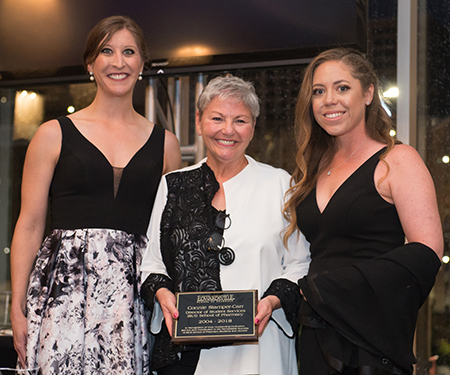 Photos: SIUE School of Pharmacy alumnae Maggie Krumwiede (left) and Kelly Kleeman (right) presented a plaque “in recognition of truly outstanding dedication” to retiring director of Student Services Connie Stamper-Carr. 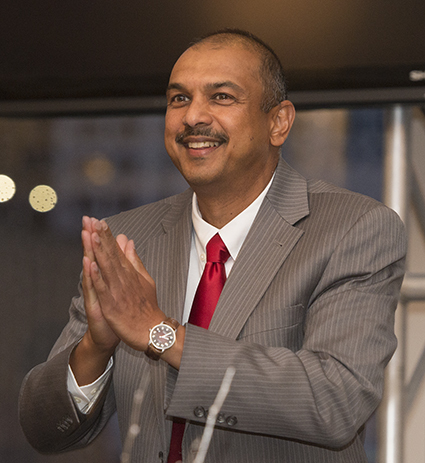 The SIUE School of Pharmacy’s Special All-Alumni Anniversary Gala commemorated the legacy of former dean Gireesh Gupchup. Interim Dean Mark Luer extended his best wishes to Connie Stamper-Carr and Gireesh Gupchup at the SIUE School of Pharmacy’s Special All-Alumni Anniversary Gala. Planning committee members enjoyed a successful evening of celebration.